VIDEO: Say again? Fun ways to teach pronunciation to ESL learners | So, You Think You Can Teach ESL? Parents of English language learners put a big premium on correct pronunciation. They want their children to thrive in environments where English is the primary, if not only, spoken language. But correct pronunciation doesn’t come naturally. Some children have a tough time getting their mouths around English phonemes, or the smallest sounds in words. 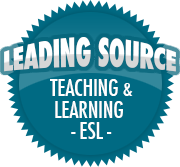 Why patience is essential for teachers, parents and students in the online ESL classroom. Did I miss anything? Let me know in the comments. Also, feel free to suggest topics for other blogs or videos.